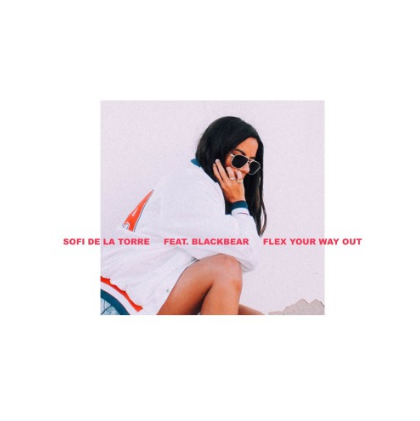 SOFI DE LA TORRE, the Spanish singer from the Canary Islands, shares her newest single, Flex Your Way Out featuring multi-talented LA artist Blackbear, earlier this month, under the self-styled banner #PopDoneRight. The track finds the two singers mirroring their dreamy vocals over Finnish pop producer Jonas Karlsson’s soothing, trap-infused instrumental. Whilst SOFI DE LA TORRE is exposing a darker and more introverted side, as she laments the end of a relationship, the overall feel is one of closure and optimism. Blackbear rose to fame as a co-writer on Justin Bieber’s 2012 hit Boyfriend. Since then the 25-year old producer has developed an intriguing musical persona – pursuing R&B and rap influences and working with hip-hop artists such as Childish Gambino and Machine Gun Kelly, as well as Pharrell Williams and James Blake. Following the success of Sofi’s track Vermillion, which gained support from the Guardian, TIME Magazine and Billboard, Flex Your Way Out serves as the perfect showcase of Sofi’s continued ability to craft hit records. With a currently untitled EP expected to follow, the anticipation has certainly been mounting since Sofi’s latest project, Mess’ which debuted autumn 2015, and received praise across the board from Noisey to Pop Justice. Resolutely independent, Sofi’s latest release provides an introverted perspective to her unique pop style. Performing under the banner of #PopDoneRight, she continues to stress how pop should be heartfelt, original and accessible. ‘Flex Your Way Out’ serves as an introduction for many and embodies the sound that Sofi has pioneered, whilst standing as a testament to her artistic growth in 2016. Watch the video to the single.